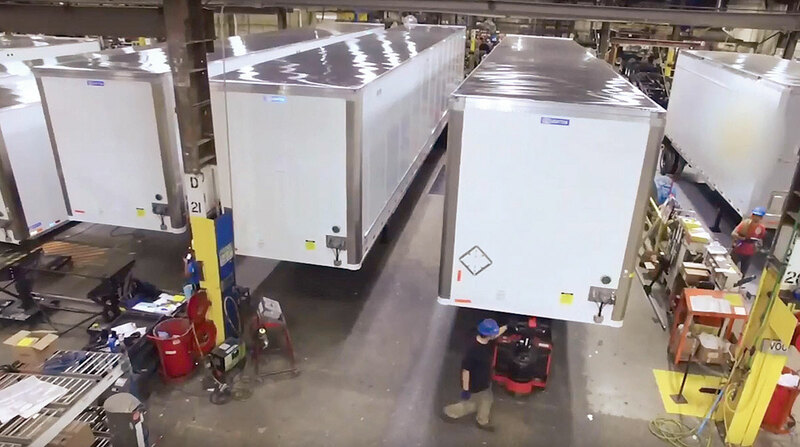 U.S. trailer orders reached an all-time peak in September, beating the previous high by more than 10,000 units, ACT Research Co. reported — and they pushed new business to manufacturers already grappling with strong backlogs well into 2019. Orders soared to 58,200 compared with 25,003 a year earlier, ACT reported, citing preliminary information it will update when trailer makers finalize the data. The previous high was 47,512 in October 2014. “There still could be some pent-up demand out there,” because trailer orders have not yet caught up with booming Class 8 orders, said Frank Maly, ACT’s director of commercial vehicle transportation analysis. Research firm FTR pegged trailer orders at 56,000. “You would have to expect that the all-time backlog is going to be broken next month,” said Don Ake, FTR vice president of commercial vehicles. Trailer makers underscored the unprecedented demand comes with pricing pressures. September orders came after the nation’s only publicly traded trailer maker lowered its guidance for its third-quarter results. “Higher commodity and component costs impacted the quarterly results as raw material costs continued to escalate,” Wabash National Corp. announced in a statement Oct. 12. Wabash said for the period ending Sept. 30 net income could be between $3.5 million and $5.5 million, or 6 cents and 9 cents per diluted share, compared with $18.9 million, or 30 cents, a year earlier. You would have to expect that the all-time backlog is going to be broken next month. 2018 will be a high-volume year for Great Dane and the industry, said David Gilliland, vice president of national accounts for Great Dane. “But margins have been suppressed by the increases in materials we could not recoup,” he said. At the same tine, the buying cycle has changed, Gilliland said. One diversified carrier said determining the manufacturers’ prices for trailers yet to come is becoming more difficult. “We are seeing much smaller windows that [trailer makers] seem willing to commit to consistent pricing,” G&D Integrated Chief Operating Officer Jeff Cohen said. The Morton, Ill.-based transportation and logistics company offers truckload and intermodal drayage services, and uses dry van trailers, tankers and flatbeds, and step-decks. G&D has 430 trucks and 2,100 trailing assets, including about 400 intermodal chassis. Meanwhile, Cohen has seen an increase in shippers putting out bids that require the use of newer trailers, 10 years old or younger. “I think they are just using that as a standard to help ensure that there’s integrity in trailer structure, no potential product damage because of leaks or the conditions of floors or walls — using that as a proxy rather than having to do deep inspections of every trailer,” he said. Another trailer maker said it has placed a hold on some new orders. At East Manufacturing Corp., orders have been up 30% on average each month year-over-year since October 2017. “All products are out to February with a few slots remaining at the end of that month, and March is 60% filled for available slots on all products,” East President David dePoincy said. Meanwhile, Hyundai Translead sees sufficient good news in freight availability and rates “for a long while yet,” Chief Sales Officer Stuart James said. “But there are also structural changes taking place that show promise for a longer effect,” he said. ‘I am thinking here about the impact of the driver shortage being exacerbated by ELDs as well as the relative costs of the tractor versus a trailer.